I am really excited for Halloween this year. 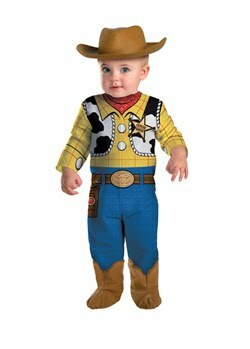 This will be my little boys first Halloween! When I was a kid Halloween was filled with so much fun and excitement! We always dressed up, decorated the house, trick or treated and passed out candy as it became to late for us kids to be out. I have very fond memories of being a witch, a pumpkin, and many more creatures. I want to make every Halloween for my little boy just as wonderful and full of amazement as my Halloweens were. I found a great partner in making those Halloween adventures possible. 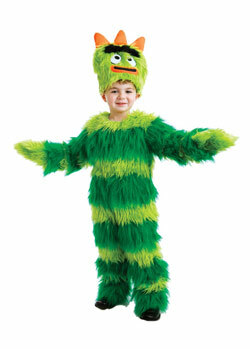 The Wholesale Costume Club offers scary and cute costumes for all ages. Everything from vampires, witches, and dinosaurs to the not so scary pumpkins, super heroes, and cowboys. They also have character favorites such as Woody and Buzz from Toy Story, Batman, Superman, Spiderman, Barney and Friends, Elmo, Winnie the Pooh and friends, Madeline, Scooby Doo, Star Wars, and Yo Gabba Gabba! There are too many great costumes to list! 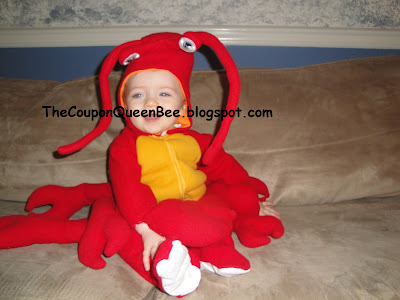 Out of all the Infant/Toddler costumes we picked for my little guy to be a LOBSTER! I thought this would be a wonderful and unique creature for my son to be on his first Halloween. He looks so cute in his costume and was smiling and laughing as he was wearing it. It fit him perfect to the size I ordered and has a Velcro neck fastener to cover the zipper. 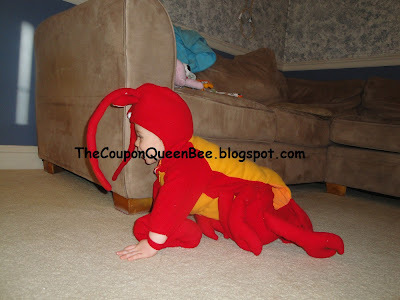 He was loving wearing the head part of the costume and pulled on his antennae with delight. His dads face lit up with a huge smile when I showed him, his dad LOVES to eat lobster! We both agree the quality of the costume is excellent and will hold up to the wiggling and crawling our son does. The colors are vibrant and the claws and tail were the perfect lobster body. We will have to have him wear it for more than Halloween just for fun! We even went in the back yard after dark to test the warmth of the costume and it kept our little guy comfy and warm. 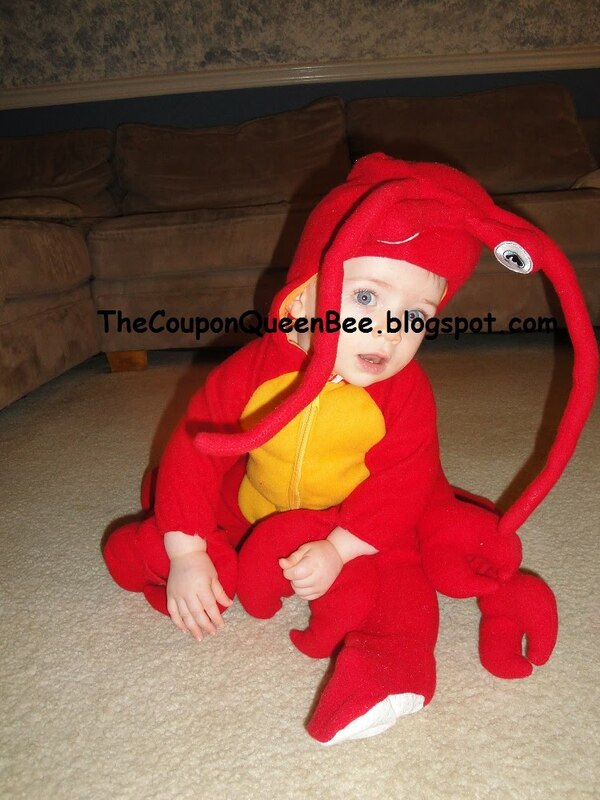 You can have this lobster costume for your little one for only $36.98 non member price. 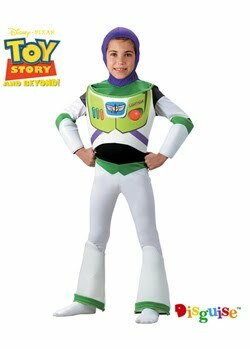 Your kids only have so many Halloweens to experience as a child so make this Halloween special by buying your costume at Wholesale Costume Club. Wholesale Costume Club offers low prices well below retail but offers an even greater discount for members of their site. For ONLY $5 a year you can have access to the lowest prices with no minimum purchase requirements. They will NOT send you any products during the year so need to worry about unwanted items and they will NOT auto renew your membership. They do offer you a cheaper shipping discount. Shipping for members starts at $5.99. This would be a great way to save money on costumes all year long for events such as plays, costume parties, fundraisers, or just general fun! I had my little guy in a monkey costume in January just because it was so cute! No holiday or special event needed to put a smile on your face from a cutie in a costume. So if you are a member or not you will get great savings on all your costume needs. Remember to check back at Wholesale Costume Club for Christmas costumes. Last year my little guy was Santa this year maybe and elf or reindeer! * This post is my honest opinion and may vary from other opinions. I was not paid for this post. 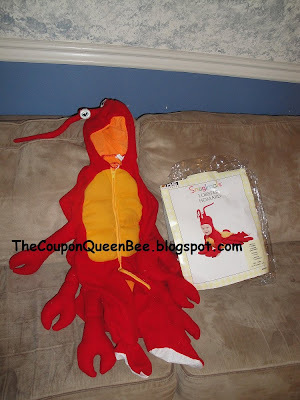 I was provided for free one lobster costume to review. Thank you so much for adding our event button and wanted to spread the word about SPD! Love, love, love your pictures! TOO cute!